"Thanks for the opportunity to buy the marvellous 'Pedilux'. My feet are unrecognisable after 3 months. For years I have wished that such a system was available - thanks again. " Pedilux footcare systems are supplied as standard with five interchangeable instruments that trim, file shape and polish. All the tools 'click' securely into place using a patented magnetic locking system. The benefit of the system is that while securely locking the instruments in place for use it allows the tools to be removed with ease when changing tools. The grinding instruments are built to last and are encrusted with genuine sapphire, ensuring they are virtually everlasting. These instruments are included with the Profi and Two-Way systems, however, it is advisable, for hygiene reasons, to have a second set of tools if the system is to be shared. All instruments can be bought separately. 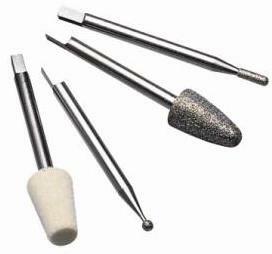 is used for smoothing and polishing the borders and surfaces of nails. The Felt Polishing Cone keeps your nails mirror smooth for the perfect finish. is designed specifically for treating in-grown toe nails. Starting in the front corners, file your nails free and without fear. There is no risk of injury. Also used for treating crumbly nails or those infected by mycosis - especially on the underside. is used for removing corns. When removing corns grind them flat, then work on the thorn in the middle, holding the instrument horizontally. As well as the five instruments included with the Pedilux Profi and Pedilux Two Way we offer 5 additional tools, sold individually. is a rougher version of the standard grinding cone for more robust treatment. is a larger version of the Sapphire Grinding Cone - almost double in length. This instrument allows treatment of large areas, bringing even quicker relief.